V is for vulture and vase and van. 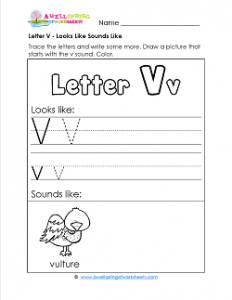 There’s already a vulture on this letter v looks like sounds like worksheet. So what else will your kids draw that starts with the v sound? Besides drawing a picture, kids trace and write the uppercase and lowercase Vv showing what they look like. Please be sure there’s plenty of time to color, too. Kids can color the pictures and the bubble writing “Letter Vv” at the top of the page.